Mix equals parts flour and baking soda and dust plants (cabbage, broccoli, kale) being eaten by cabbage worms. They much on the leaves and die usually in a day or two. Repeat as needed. Simply wet the crabgrass, pour a heavy dusting of baking soda on the weed. The crabgrass should start dying back in 2 or 3 days. CAUTION: When applying baking try NOT to get it on your grass as too much baking soda can burn and kill it. 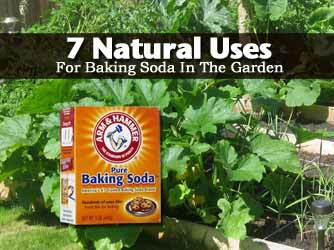 I hope you enjoyed these baking soda tips and they come in handy helping you live a greener life!